Updated: June 15, 2018 to include “Popular Times”, “Chat To You”, “Photo Insights” as well as whether or not GMB Insights collects data from paid ads. Google My Business has just reformatted their Insights and a few things have changed. Here is what you need to know. This chart is only reporting on impressions (not clicks). This graph is a bit confusing if you don’t understand that when both boxes are checked, the graph is cumulative (the top of the graph includes the total of both numbers). So for those of you scratching your head wondering why the heck the graph is up near 60 for July 25th in this picture when you hover over it, it’s saying 17, you’re not alone. Here is how you actually see the numbers – the total searches on Maps was 41. The total searches on Search is 17. Therefore the total for the two is 58, which is what the graph is showing. Yes, very confusing. To avoid confusion just look at the graphs separately (only click one box – either Search or Maps). Searches on the Local Finder are included in “Search” since they happen on Google.com and not Maps.Google.com. Views in Google My Business Insights are like impressions. They are not clicks on your listing. They are also not unique, so one user looking through 50 of your photos would count as 50 views. Why don’t the Total Views match the Total Searches in the pie graph under “How Customers Search for your Business”? Nothing really new here. It shows where your driving directions came from if you have enough of them. And Google recently started showing details about the areas where your direction requests come from including a nice heat map. If driving directions seem high, it’s probably because you are in a building and Google is counting driving directions that were actually to other businesses at the same address. Don’t be surprised if the numbers on this graph don’t match the numbers under “customer actions”. This graph shows 4 weeks whereas the actions section shows 30 days. As Tim Capper illustrated, you can still copy and paste the values into a spreadsheet if it’s easier to interpret the data that way. The GMB Messaging feature is the newest feature that generates insights data. You first need to setup the GMB Messaging feature before Google can collect these insights. As of recently Google is pulling in some useful insights related to photos. My church (in a very small town) gets an average of 20-40 photo views a day. When I asked Google for an explanation for this, they said that “view photos” is counting both impressions (the photo appears in the 3-pack or knowledge panel) and if a user clicks to go to the photos. So these really are not clicks but rather impressions (and could be very misleading). 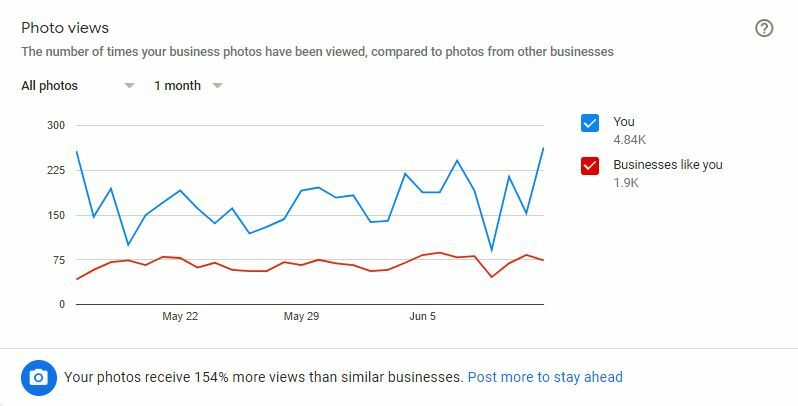 This section will compare the number of times your business photos have been viewed, compared to photos from other businesses. Popular Times data gets pulled into the Insights section of GMB for businesses that have a decent amount of foot traffic. If you have “Popular Times” displaying in your knowledge panel then you will likely see the data in Insights as well. Does Insights Data Include Data From AdWords? Yes. If a business has an AdWords account that has Location Extensions added, the users will be taken to to the Google My Business listing when they click on the extension. When a user clicks on the ad in the 3–pack the person would get taken to the GMB listing (not the website). Clicking on the listing would count as a search in Google My Business Insights. If the listing shows up as an ad and then also as a listing organically in the 3-pack, it would count as 2 searches (impressions) in GMB Insights. 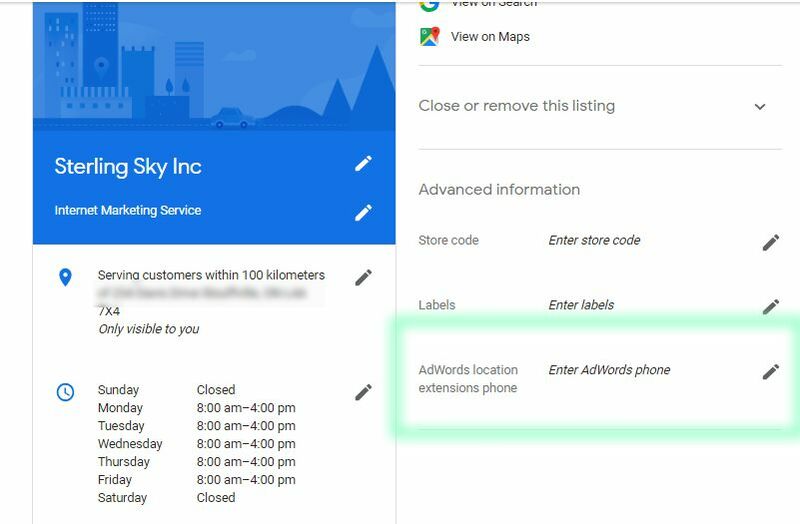 There is currently no way to track AdWords data separately from regular organic data in the GMB Insights section so my recommendation would be to add a call tracking number in the AdWords Location Extension field in the Google My Business dashboard so you can accurately track the calls from ads. I don’t understand why Google has such a hard time delivering a simple and useful dashboard for GMB. It could so easily be a crude simple version of Google Analytics but instead they seem make it more complex and difficult to get to meaningful information. I liked the Insight as they were a week ago in terms of stats. I have accepted that they will never give use search terms again, but I wish they would give us beck the clicks for directions, call and to website. The has not rolled out completely yet. I have yet to see it. I contacted GMB via Twitter and they had no idea when. Yeah it’s only rolled out to a small percentage of users at the moment. Thanks for letting those who have not seen this new dashboard in on what’s coming Joy. The change gnomes are at it again. I hope they continue to support we G+ faithful. I still post on the top 3 but I consider the other 2 social and G+ tied to Google Search. Google hash-tags are the only ones I feel are viable. Can you please explain how the impressions of “How Customers Search for your Business” are different that the total views of “Where Customers View your Business on Google”? How are there more views (624) than impressions (324)? In this case it that implying that there were 324 keyword phrases searched, and most people flipped between search and maps? A similar concept to sessions and pageviews on a website? What about when there are more ‘Impressions” (direct/discovery) than total views? How is it possible that someone viewed a business that gets counted in direct/discovery metric, but not in search/maps. Why would it not also be in the data set for search/maps? thanks for breaking this down! I asked Google about this and they replied back with: My thought here is that it’s total views (someone pulls up Maps, sees the local businesses along the side, even though they were searching for something else, scrolls through their local area and sees multiple listings, etc) versus actual searches where users are searching for your business name or the category and they pull up your business. This would explain the pretty large discrepancy as well. Thanks for such a great info. What is the minimum duration of a call which google shows as a call in insight? Also what if someone just clicked on the call button and abort from dialer ? Does google count this action as a call? Good information on GMB insights. Thanks to GMB API, now we can integrate insights data to get more analysis. Do you know if GMB Insights will properly associate these impressions with Direct vs. Discovery? If the listing shows up twice (ad and organic), I’m pretty sure it would count as 2 impressions but I’m not 100% sure on that. They would be direct if the search was something branded that returned their knowledge graph and would be discovery if it was something that triggered a 3-pack. Love reading you Joy. 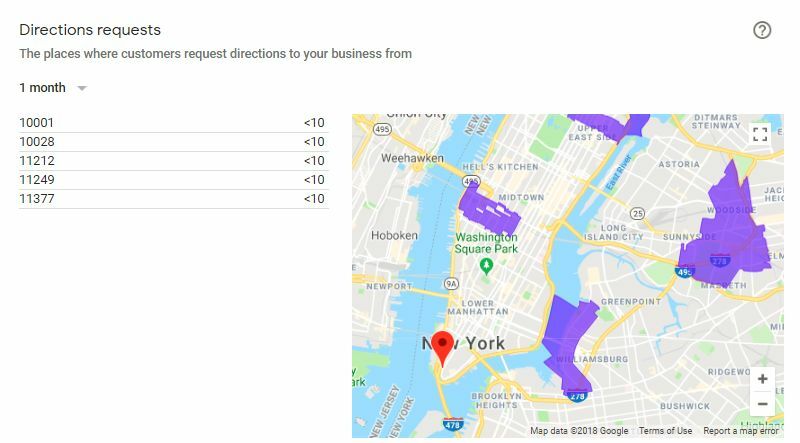 I noticed in AdWords today that you can segment you location extension to see “local actions” such as directions, website clicks, orders, menu views, and other engagements. Businesses could eventually take GMB Insights and deduct AdWords data if they want to measure real organic/local traffic. Very interesting. I don’t see it yet 🙁 Are you able to email me a screenshot? Can I change the date range for the google my business insights or is it only what they give me? I can’t see anywhere to change it. In the GMB dashboard you can only use the pre-selected date ranges. You can download a custom date range by using Bulk Insights or use a 3rd party tool to get that ability. I have noticed that, on photo views chart, “companies like yours” had a lot more views and a bunch of new photos from clients. Could that be the explanation? If it is, how can those numbers, which refer to business like mine, boost my own results? It’s likely that your listing started showing for some new queries or the ranking increased. Google should be rolling out keywords to Insights soon so hopefully that will give you some ideas. Do you happen to know of the way that Google collects the clicks and impressions for Google Posts? I would like to clarify for a client: (1) are impressions any time the Posts appear in the general search results, or is it when the user scrolls to see the Posts and (2) are clicks any time the user clicks on the Posts itself, or when the user clicks on the action button? Any insight you can provide would be very helpful. I’ll ask Google and get back to you. I heard back from Google. Here are the answers. A post impression is generally counted when the post appears on the screen. For example, in the posts tab on the listing, we don’t automatically count a view for all posts ever created because the post tab is opened. Rather, we count a view on that post when it scrolls into view. We report clicks on the action button. Hi, 🙂 Can I post a question? The topic is GMB listing insights queries for my business. Thank you. My insights queries are showing incorrect and damaging keyword phrases. This has really upset me. I’m a registered massage therapist. I have been in the listing for ten years and now my business is failing. My ranking in GMB listing dropped in the Summer and I started making weekly posts with short articles and it boosted my ranking back up again. Then a month ago I lost my ranking again and had my web designer make several updates to my website. My ranking did improve but my business had not improved. Please help. Thank you. Thanks for your assistance Joy! Is there any way to know the rank of my listing on the GMB sort of Ad rank ? No, Google doesn’t have anything similar to Ad Rank for GMB. 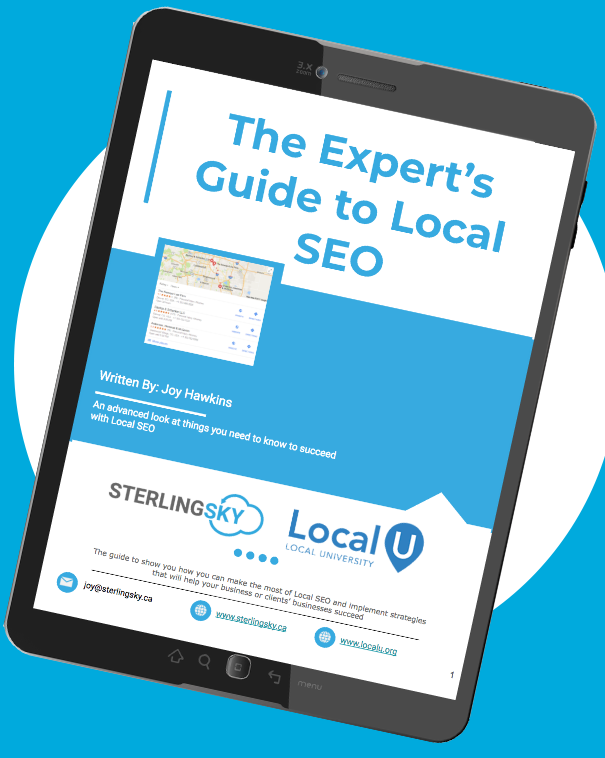 When a local business search is made, and a GMB three pack snippet appears, would the businesses listed in that three pack have an impression listed in there Google Search Console? What would the rank value be? Could it be counted as position 1 for all three businesses? (if there are no other organic listings above it) could it be position 1,2 & 3 of organic search? Is it counted as an impression at all? Where in Google data and tools can we determine how well our efforts to get the client listed in the three pack are working? The impressions are definitely counted in Search Console. The rank value would be the order you see it on the page so if they are first in the 3pack with no organic listings above them, that would count as 1. If it’s a Knowledge Panel (off to the right), it usually counts as 11. I suggest using UTM codes in Google My Business if you want to break up the traffic. Can the insights for the business change after few months for same interval of time, because my post view for last year campaign in higher than total searches now. So views and searches are different. The article kind of digs into this quite a bit but they never match due to the nature in which they are calculated. Views are usually higher (much higher) than searches. What does ‘A customer found your business via Google Maps’ mean? Does it mean that a customer clicked on your listing in google maps or just the impressions? And if it’s just the impression then until which number is the impression counted because a total of 20 results appear? Are all 20 considered or top 3? I believe the customers are people that clicked the follow button on your listing on Google Maps. Why does the ‘total views’ in the ‘Where customers view your business on Google’ section differ from ‘total searches’ in the ‘How customers search for your business’ section? Views can be something like a person simply loading Google Maps on their phone and seeing an icon on the map for the business (or not seeing it, it’s simply visible). They are like impressions on a display campaign.